If wearable tech wasn't a burning innovation all by itself, there's new technology emerging on nearly every front. From rule-breaking battery life, to professional level virtual sports coaching, to new frontiers in gaming, innovation is happening at an unprecedented rate. That's why we at Wareable have picked out our top wearable innovations that have the power to turn the next generation of devices into true game-changers. Back in September I was invited to the Royal Institution in London to witness something incredible. Lord Drayson, CEO of Drayson Technologies, had created Freevolt, a device that turns wasted RF signals from Wi-Fi networks and phone masts into power. He showed it off in a new device, powering an air quality sensor called CleanSpace, and talked about the potential for wearables and the smart home. The idea behind Freevolt is that you'd no longer need to worry about the batteries in your smoke alarm, smart thermostat and even, one day, fitness tracker. If the technology of being able to create power from literally thin air wasn't exciting enough, to me the fact that Drayson had actually brought it to market was mindblowing. Yes, it's still limited, but a better smart tech innovation this year is hard to fathom. My colleague Sophie had boldly claimed that her Vive hands-on had blown her socks further off her feet than any Oculus experience had back in March. I told her she was a fool. After all, she hadn't hadn't seen Reel FX's stunning The Book of Life Rift demo like I had at SXSW. However, a minute into entering the Secret Shop experience, based on Valve's Dota 2, at Gamescom in August, and I knew that she was right. In all of my years reporting on the latest and greatest tech innovations, nothing has taken my breath away quite as much as Vive's most impressive demo, powered by Valve's Lighthouse tech, did. It's fair to say that the VR revolution is now in full swing and Wareable has had all the big name VR headsets strapped on its collective bonce over the last few months. But it's HTC's Valve-powered effort that is creating the loudest "wow" moments. We can't wait for the consumer release in 2016. It's easy to get lost in the many smartwatches and fitness trackers that launched this year and forget about some of the truly innovative ways people are embracing wearable technology. While I'm not currently in a position to need one, this wireless Bluetooth thermometer for babies I spotted at the beginning of the year at CES, definitely falls into that life changing category. 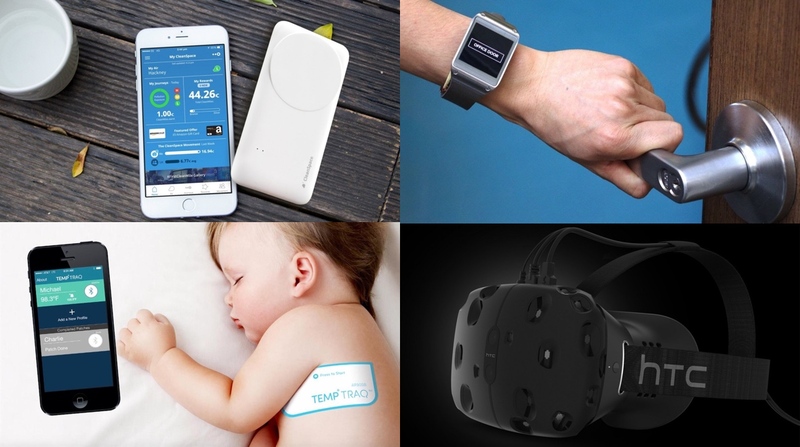 When the patch is placed underneath the baby's arm, parents can continually monitor temperature over a 24-hour period from an iPhone or Android smartphone. It's finally been FDA approved and you can buy the single use ones for $24.99. This is only the start of being able to monitor health accurately from your home and it's only going to get bigger and better in years to come. Can I pick HTC Vive and Valve Lighthouse too? No? Fine but Paul's entry is well and truly seconded. Many of the most impressive innovations I've seen this year have actually been the result of bringing tech back to basics in proof of concepts for payment wearables or the low cost, high impact devices in Unicef's Wearables for Good challenge. But I'm going with one story that really captured Wareable readers' imaginations this year, the Disney smartwatch that knows what object you're touching by detecting electromagnetic signals through our bodies. Like Magic Leap, this kind of technology turns the world around us into something that's connected and augmented but it does this without screens. Based on what you touch, the tech will know that you're making a coffee or leaving the house and can make your wearables and smart home give you exactly what you need. Yes, please. It has to be VR related right? 2016 is set to be a huge year for virtual reality and, while Oculus Rift made all the early waves (and we're not writing off Palmer and the gang by any stretch), HTC's decision to team up with Valve and embrace the power of Steam looks like a masterstroke.